The winning boat: Gotcha takes the Santa Cruz 27 national championship. AYC member Joe Hagen is the new Santa Cruz 27 National Champion, with Chris Winnard of Ullman Sails driving and AYC member Al Lehman Jr. calling tactics. Joe’s bright red Gotcha was the hands-down winner in the regatta that wrapped up Sunday, June 2, winning five races, finishing third in two more and tossing out an 11th place finish. They closed the regatta with a total of 11 points, well ahead of second place finisher Hanalei with 17. Here are the results. Last year Joe and this same team also won the championship and in 2011 (with AYC’s Steve Quant at the helm) finished second. 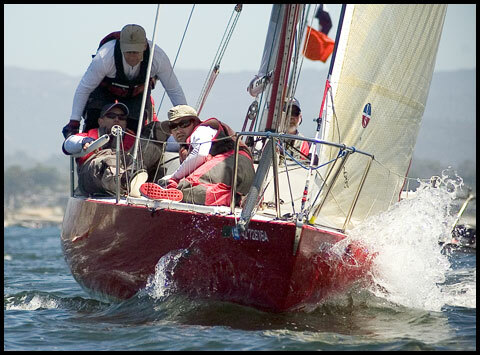 The SC27 Nationals were held in conjunction with the first Made in Santa Cruz Race Week, showcasing the many boats designed and built in the California coastal city. The regatta was a big hit, as you’ll see in this report.